One Woman’s Pursuit of Realness: Episode 1 – Freshers at 30! As I approach my 34th birthday and, only now, feel that I am building strong foundations for a healthy and happy future – I have been doing a lot of thinking about how I got here. 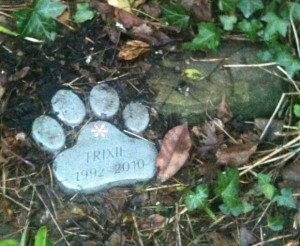 Triggered by the loss of my family dog and 18-year-old Westie, Trixie – on the 26th December 2009 I smashed my illusion of a perfect life into pieces. The same day that Trixie died and closely after my rock band, Life with Max, had disbanded; I left my husband, moved in with my parents and, a couple of weeks later, I decided to leave my well-paid full-time job to go to university and study journalism and media. My life was now a blank canvas. How can a little dog inspire so much change? Well, this little dog was different. Trixie had been by my side since I was 12 and without her I would not have had the emotional strength to survive the suppressed memories of childhood abuse that only rose to the surface when I was 19. She licked away my tears many times and kept me strong with her pure unconditional love and compassion. A love I now enjoy from my two little dogs, Roxie and Millie. A Teenage Rebirth – What is Real? When the harrowing memories arose in my late teens I was living in London alone and had what I can only describe as a dramatic rebirth. I was constantly picking apart my memories with precision trying to work out what was real and bounced around aimlessly under the label of spontaneity and adventure for several years. Friends thought I was brave and I thought I was unique and ambitious but the truth was – I was scared and running. From studying at theatre school and rock school to wiggling my bum at a Cats audition or singing my heart out as a P!nk tribute and dancing around as Hippo at Hamleys Toy Store in Oxford Street – I had tried and tested every possible avenue in the performing arts. It wasn’t until I met my husband in a London houseshare in 2004 that I married and moved back to my hometown of Portsmouth to pursue a sensible life with a proper job, in addition to starting an original rock band together on the side. There were good times, I have no regrets and not a day goes by that I don’t miss performing in the band but there was always something unsettling beneath it all. A feeling that this wasn’t quite right. That there was more to life that I hadn’t yet discovered. 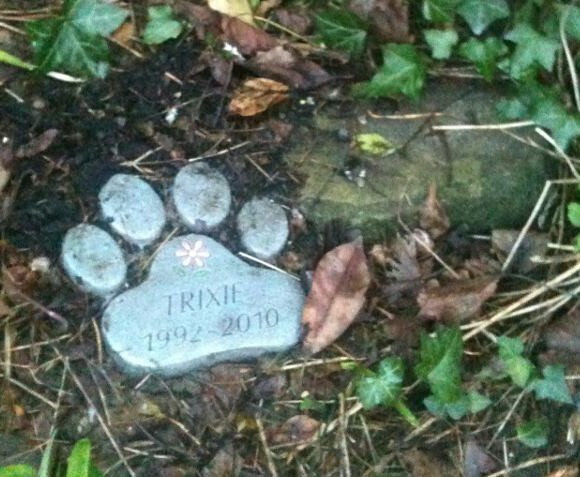 The day I buried little Trixie in 2009 singing a song I had written for her (Phoebe from Friends eat your heart out), marked the beginning of a new chapter for me. Faced with the finality of death, I was ready to find out what it is I really wanted and begin my own pursuit of realness. I would like to say that it has been as simple as just putting the pieces back together bit-by-bit but it hasn’t. One bolt of lightening after another I have been tested, pushed, heart broken, severely depressed and back to hyperactive and proactive. It has been an erratic journey of screams, tears, laughter, drunken antics and chilled out epiphanies. I would like to think I can write a novel about it but I am just too impatient for that. So instead, I finally feel ready to get personal and share my journey with a series of blog posts called ‘One Woman’s Pursuit of Realness’. Kicking off with the place where my pursuit of realness began – experiencing university freshers at 30. Your 30th birthday can be a daunting experience. It is often the moment you realise that you really should be a grown up by now. That now is the time to settle, build foundations and prepare to have children (if you haven’t already). For me? Not so much. My first day at university was my 30th birthday. While I had these grand ideas that I would quickly bond with my fellow students and get pissed on my first day to celebrate, this didn’t happen. It was an anti-climax to say the least. 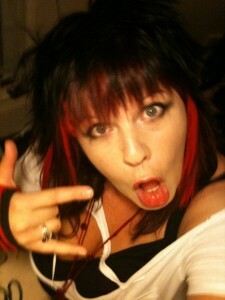 Luckily I had planned a massive party and made everyone dress up as their alter-ego. A great excuse for me to dress up as mine, a punk rock fairy I eventually name Sky La Roux, which I will explain later in the series. That night was awesome. I actually had my husband in tow after a 6 month separation and at this point we were just a few weeks into a romantic revival of our relationship. We were still under the illusion that we were going to fan the flames and find a way to make it work, even though he had now moved to London and I was at university in Portsmouth. 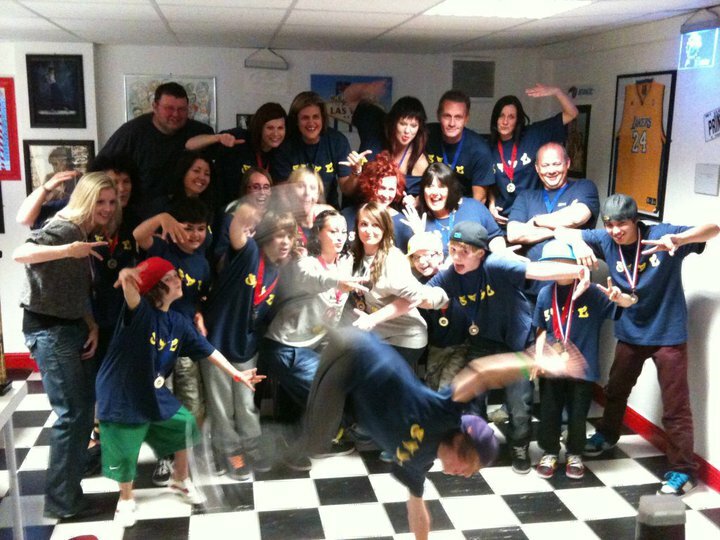 We drank, we danced all night and I shared hugs and silly selfies with my closest friends and family including my adult hip hop dance crew who had helped me rebuild my confidence since the separation (pictured below). My ‘mature’ friends Joy and Amanda also decided to steal my secret stash of rum and completely embraced the experience in rock chic tutus and inflatable electric guitars. 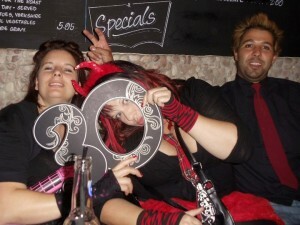 They were the drunken rock angels of the evening and my 30th birthday party wouldn’t have been the same without them. In fact, it was this kind of compulsion us ‘mature ladies’ have to be completely ourselves only when drunk that helped lead me to this point. Why did we only get to release that side of our personality on special occasions? So many of us have inner ambitions or dreams that we exercise at parties or allow out at night. The dancer taking centre stage at the club, the singer obsessed with karaoke, the performer or comedian that grabs the mic at the end of the night among friends and family (P.s. all of these have been me at some point). I wanted to use this time at university to explore what it is that I truly feel passionate about… what it is I really want to be ‘when I grow up’ and to just BE just that. No more censorship, daily grind or monotony. I didn’t expect to solve world hunger or save lives but I now wanted my life and career to have some sense of meaning and most of all, I needed to feel a sense of purpose every day. Ultimately, I wanted to find out how to be drunk on life. I loved it! And unlike the early fallers and thrower uppers that had gone over board on the pre drinks, I was fully embracing the experience of being a fresher at 30 – dancing all night and drinking every day with the rest of them. Of course, at my age, I did reach a point when being admitted to hospital could be likely, so after the first week I switched to fake drinking. “Ooh what are you drinking?”, “Oh this? It’s a massive pint of coke with vodka, mmmm” NOT! After joining the dance club I also experienced the drinking games and bully tactics I thought were only real on American teen movies and sororities. While I took part in some, most of all I said something along the lines of: “Dude, if I want to drink I will drink… now back off!”. A sign that I was not THAT willing to embrace the freshers experience. It didn’t take me long to realise that university needed to be about more than just getting drunk – well duh! [pulls teenage angst face]. In my hungover stupor I was still quick to look for any extra activities or groups that would enhance my university experience and interviewed for the magazines online editor position in my second week. I was in and had taken my first step into magazine journalism. Despite the fact that I was officially a ‘mature’ student, I quickly became known as the most immature among us but I was also a ‘go to’ for a lot of the students when they needed support. I quickly connected with the lecturers, I was embraced by the students and I was ready for my university experience. Bring it on! Watch out for the next episode of One Woman’s Pursuit of Realness coming soon! To stay up to date with my blog posts or listen to me babble on some more please follow me @jenniferthered or find me on Facebook at http://www.facebook.com/jenthered.music. Previous My Weight Loss Journey: And the First Stone is Off!